Paestum, located about 70 kilometers south of the Sorrentine Peninsula, was founded by ancient Greeks in the 7th century BC and is famous still today for the perfectly preserved Greek temples, which have recently been declared a UNESCO World Heritage Site. The trip from Sorrento to Paestum is rather long, so the best option is to book a private driver for a car tour or rent a car and drive yourself. To reach Paestum by public transportation, you will need to travel to Naples and take the train from there; the archaeological ruins are about a 15 minute walk from the train station. If you are travelling by car, don't miss the opportunity to stop at one of the many artisan cheesemakers along the road, specialized in making the area's famous mozzarella di bufala, or buffalo mozzarella. We suggest visiting Vannulo, which offers tours of the buffalo farm, a farm shop with a variety of artisan cheeses, a farm restaurant featuring dishes based on farm products, and a gelateria specialized in buffalo milk gelato. The temples at Paestum were built by ancient Greeks who initially settled at Sibari in Calabria before beginning to expand their territory along the coastline of southern Italy, creating what is now known as Magna Grecia. Paestum was once called “Poseidonia” in honor of the god of the sea, protector of sailors. It reached its glory around 500 BC, but by the 4th century BC the area had begun to experience flooding caused by sediment at the mouth of the river Salso, which ran along the walls of the city. Over the centuries, residents began to leave the city until it was finally abandoned completely between 800 and 900 AD. Ironically, the abandonment of the city was a lucky stroke for the temples of Paestum, which were left intact over the millenia. They were gradually rediscovered beginning in the 1700's by travellers on the Grand Tour, and in 1907 the first archaeological digs began, which lasted into the 1970's. After entering through the main gate, you will first come upon the “Temple of Ceres”, once dedicated to the Goddess of Athens. Continue south, passing the forum, a group of houses, and the amphitheater, all of which offer a view into daily life during Roman times. The Temple of Neptune (or Poseidon in Greek times) is located to the south, and is almost perfectly preserved. The adjacent Temple of Hera has been transformed into a Catholic basilica. 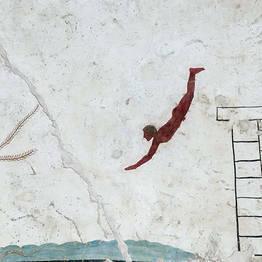 Take time to visit the site's archaeological museum, where the objects unearthed during excavations are displayed, including the famous fresco found in the Tomb of the Diver. 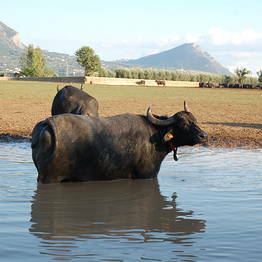 A private, full-day tour including a visit of an artisan cheese producer, mozzarella tasting, and stop at Paestum. Professional Authorized English speaking guide. Visit to Paestum, the archaeological sites in Italy. Private driving tour from Sorrento o Positano to Paestum and Amalfi, Ravello, and Positano on the Amalfi Coast.